If you need a pack that can handle scraping through sandstone canyons, scrambling up snow-covered peaks, or hauling your gear for a day of trail work, the Kestrel can manage all that and more. For quick overnights or big days out, the Kestrel 48 is made to haul heavy gear through challenging environments. If you need a pack that can handle scraping through sandstone canyons, scrambling up snow-covered peaks, or hauling your gear for a day of trail work, the Kestrel can manage all that and more. For quick overnights or big days out, the Kestrel 48 is made to haul heavy gear through challenging environments. It wouldn&apos;t be an Osprey without adjustable torso lengths to help you dial in your perfect fit and an AirScape backpanel to provide ventilation, whether you&apos;re working hard or hardly working. The integrated raincover can be deployed at the first sign of precipitation, Stow-on-the-Go trekking pole carry allows you to stash your poles when bushwhacking or scrambling, and side-zip main compartment access means you don&apos;t have to dump everything on the trail to grab what you accidentally packed in the bottom of your pack. 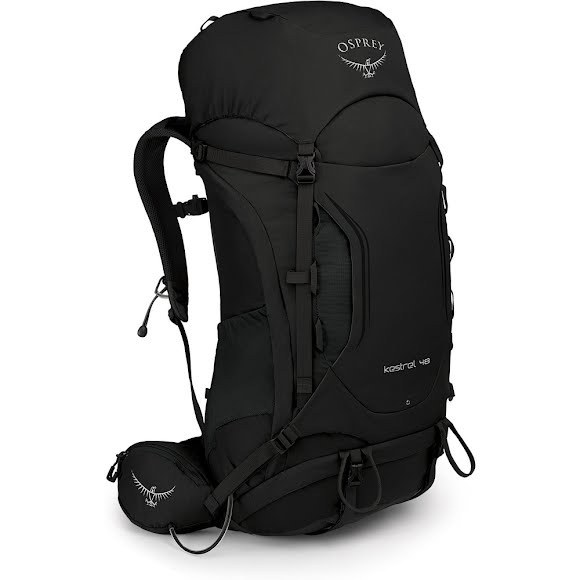 Built with rugged nylon fabrics and meets Osprey&apos;s quality standards. The AirScape backpanel offers adjustable torso lengths, while the spacermesh harness and hipbelt comfortably carry heavy loads, and a slim profile doesn&apos;t get in the way of the task at hand. Measurements S/M: 27.6" x 13.4" x 12.6", M/L: 29.5" x 13.4" x 12.6"